Pellentesque333 est magna, scelerisque in euismod id, pretium sed urna. Donec pulvinar viverra ligula, at tincidunt elit ullamcorper id. A wedding at Casa Don Francisco Hotel is a truly unique experience. Its private grounds and it is perfectly situated to enjoy the magnificent Pacific Ocean sunsets. A Religious Wedding (there is a Catholic Church on a nearby town), a non-denominational ceremony or a renewal of vows can be arranged for a simple ceremony on the beach. Casa Don Francisco Hotel is the best suited destination for small and intimate wedding gatherings. The perfect place to share with friends and family in a relaxed setting. WHY GET MARRIED IN CASA DON FRANCISCO HOTEL? Casa Don Francisco Hotel is a very original place and the perfect way to begin their married life and there are few spots on this planet as special as Casa Don Francisco Hotel. The ocean, the year around sunsets, the weather and its magic and elegance that seems to go on forever; it’s absolutely intoxicating and romantic! Those who have married in Casa Don Francisco Hotel genuinely believe that it is a very special and unique place, like no other, Casa Don Francisco Hotel combines elements not often seen together, the luxury, the nature, the elegance, the Mexican and European flavor, the theme parties, the polo and the incredible weather. This is a basic element (no paparazzi). You can also book any of the restaurants for private events. As previously mentioned, Casa Don Francisco Hotel is referred to by the sophisticated traveler as one of the World’s best well kept travel secret. One of the main reasons for this is because of its beauty. When getting married in Casa Don Francisco Hotel, people may enjoy the view, which includes different scenarios like beach, rocks illuminated by night, splendid villas, polo fields, great parties on private beaches, unique handcraft fireworks, clear waters, terrific cliffs, secluded sandy beaches and beautiful palm trees, it is inspirational for couples, as they design their great moment: music, scenery, flowers, decoration and flavors. The sea turtles, the whales, the dolphins, the Biosphere Reserve, the sunsets, the palm trees, and the beautiful bays and beaches are indeed a great place for a wedding. For many couples, Casa Don Francisco Hotel has been a very magical, natural and perfect destination wedding for their intimate exchange of vows and with very little chance of rain you can have your events outdoors. In keeping with the beauty, weddings in Casa Don Francisco Hotel are really made for great pictures. What is nice about destination weddings is that they are convenient for the bride and groom. Not only that they can get married in the lap of luxury and beauty, but also they can start their honey- moon in the most romantic and intimate place. Couples and their guests toast their vows with genuine and delicious Mexican, Asiatic and Mediterranean food in any of our restaurants. Couples are also able to choose from lavish receptions to intimate dinners or wild beach parties. 75 minutes of practicing yoga makes the body strong and flexible, it also improves the functioning of the respiratory, circulatory, digestive, and hormonal systems. Yoga brings about emotional stability and clarity of mind. Sylvia Gotzeler, native of Toronto, Ontario, Canada, has taught Hatha yoga full time in Zihuatanejo, Mexico from July 2003. The attended teacher training course encompassed an extensive study of the techniques and mechanics of each pose, meditation, how to be a safe, effective teacher and the psychology of the student-teacher relationship. Please make you reservation in advanced. Hotel Casa Don Francisco is thinking about you, offers in you private suite, it is a massage service which works for the blood circulation to reduce cellulite for the stretching of the nerves, for the corporal rest and fpr dissipating stress, a well. Likewise, the reflexology massage which produces activation of the nerves, besides being diagnosis, it is curative and it works immediatly to remove the small nuisances to make better different symptoms. Technique: Aromatherapy, Accupressure, Sports, Holistic, Limphatic, Therapeutic, Stress Reduction, Reflexology. Bring your Lap top Offers complete mobility in the pool area and the reception area. You will no longer need cables to connect your portable computer to the Internet. Private Balcony, Hammocks and Chairs. Suites have Private Swimming Pool and Ocean View. 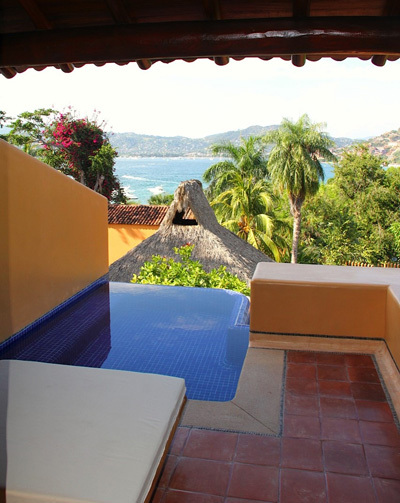 We would love for you to be our guest at the one of the most exclusive small hotels on La Ropa Beach, Zihuatanejo, Mexico. With only eight Suites you can be sure we will give you our undivided attention.